May has finally come and gone. Season finales. We love them. We hate them. And ever since the fall, I've curled up several nights a week with my cozy family on my section of the couch - sipping hot peach tea or caressing a Goldenspoon yogurt - ready for the magic to happen. The magic of our shows. The Mentalist, Once Upon a Time, Downton Abbey - to name a few. And now we've got four months of humdrum TV viewing - four arduous months of House Hunter International re-runs. It's like all my friends are going away on a long vacation. And I've heard it said that season finales are the Hollywood version of final exams. Does that mean Hollywood goes to Cabo now? What about me? All summer long - not in Cabo - still wondering who Red John is... whether Storybrooke will return to its original state... and will the pressures of Mary's bad rep put a wedge in her relationship with Matthew Crawley? And sure, certain shows feel they need to shock and awe in order to lure viewers back in the fall. But that's not the case with my favorite show this season, The Middle. 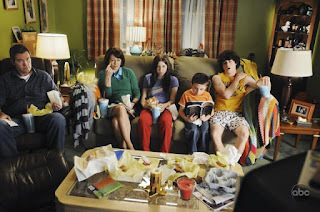 Can I just say, quite seriously, that I prayed for a show like The Middle to come along? Being a (like-totally) 80's girl, I loved Growing Pains and Family Ties and The Cosby Show a lot. And up until a couple years ago, I got to thinking, "That's it! No more clean (clean-ish) family shows ever again." But then God, in his unending patience and love for me - without a roll of the eyes or a tsk-tsk-tsk from heaven - answered my prayer. And about two weeks later, I happened upon The Middle and bam! I got hooked, along with 328 of my family members, last I counted. And for the show's season finale, no juicy cliff-hanger needed, just a sweet reminder of how precious life is. You see, Mike Heck (the father) gave a speech at his brother's wedding - a speech I wish I had at my wedding - about how tombstones have dashes on them (e.g. 1973-2073), and how because of his family, that dash will have meant something. My brain was all, "Ding ding ding!" It was so what I needed to hear. My family is the dash. My Family = My Dash. And what makes that dash everything is my love for them, which is only possible because God first loved me (1 John 4:19). So not only was that Middle episode the season finale, but the grand finale to my year in TV.